Looking for suitable premises for your event? Our modern premises are open to non-students not only during our Executive Education workshops, but also during external events. Seminar rooms and lecture halls can be rented by the hour or day. Our facilities can be used for different events according to your needs. The meeting room, for example, is a stylish venue for small conferences and can be ideally combined with the adjacent roof terrace. The foyer of the lecture hall is suitable as an exhibition space. We gladly provide audio/video equipment according to your requirements and other services are available upon request. For smaller functions or breakout sessions our seminar rooms are available. For larger events, lectures or presentations our lecture halls are convenient. According to the number of participants, you can rent one or several of them and book the required audio/video equipment. Discover a modern campus designed for team-based work. In the midst of the beautiful lakes of the Havel, the HPI's lecture halls, seminar rooms and office buildings are located on a generous campus with green spaces, fountains and a small lake. The Hasso Plattner Institute (HPI) in Potsdam is one of Germany‘s most noted university institutes for IT and Europe’s biggest hub for Design Thinking education. 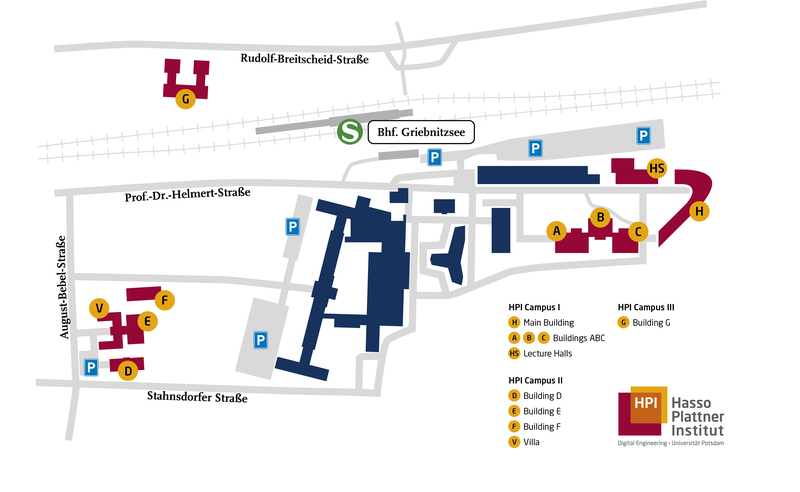 Situated directly next to the Griebnitzsee metropolitan train (S-Bahn) station, the HPI in Potsdam-Babelsberg is superbly located in terms of accessibility. On S-Bahn line S7, it is just a short ride to both the capital Berlin and Potsdam’s city center. The lake-side campus is an impressive oasis of greenery set in beautifully tended grounds providing modern facilities for any event. Click here for our directions.